This is the chronicle of an unforgettable part of history - twelve crazy, painful, see-saw years, from the Wall Street crash to Pearl Harbor. By juxtaposing contemporary news and documentary footage with extracts from Hollywood classics (such as Golddiggers, Lady Killer, and Wild Boys of the Road), director Philippe Mora offers us an evocative scrapbook of the 1930's. Two heroes emerge in these films: James Cagney (the hood-with-a-heart-of-gold, the little man who won't be beaten), and Franklin D. Roosevelt (the tough-yet-benign man leading America through her most difficult years). 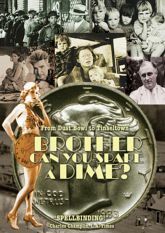 Songs and images stick in the mind: fortunes dwindle, the small man's savings disappear, even the Banks go bust�men lose their jobs and join the breadlines to the haunting title song of "Brother, Can You Spare a Dime?". Hobos and oakies take to the road while Bessie Smith sings "Nobody Loves You When You're Down and Out"; a ragged child huddles against the bleak landscape as Woody Guthrie sings the "Dustbowl Blues." Only Hollywood offers an escape from reality in these years. We glimpse Clark Gable and Vivien Leigh at the screen test of Gone With the Wind�George Raft dances a languorous tango with Carole Lombard�Shirley Temple dimples and Chaplin jokes, while Busby Berkeley fills the screen with his lavish extravaganzas. The marathon dancers stumble on...as Ginger Rogers says, "It's the Depression, dearie..."